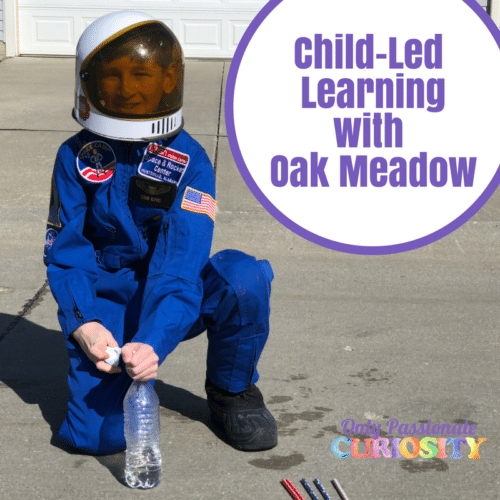 This post is sponsored by Oak Meadow – check them out for hands-on, creative curriculum! This week, Bug’s been learning all about the History of Space Travel in his Oak Meadow Grade 7 World History book. He’s been looking forward to this week in his book all year. Last year, he had the chance to go to Space Camp and fell in love with all things space related. I love homeschooling for many reasons, but this week really highlighted the benefits of student-lead learning. In our homeschool, I try to allow room for the kids to explore their interests. We’ve tried many curriculum programs over the years and I’ve found that the more the programs try to give me check-lists and to-do lists and reading lists and lists on lists of things to do . . . the less time the kids get to really explore. So much learning can happen when kids have the freedom to be kids. Which is exactly why Oak Meadow works so well for us. The curriculum is concise and purposeful. Lessons are clearly laid out and well designed, so I am not wasting time trying to figure out what to do. I don’t have to gather a huge amount of supplies, or schedule much of anything, or worry about when I am going to find time to do a complicated demonstration or help with a challenging assignment. More importantly, this curriculum is designed to support kids as they learn to be independent learners. At this level (grade 7), Oak Meadow really is child-led. The text is written to Bug (I have a teacher’s manual with notes to help when I need it). Within the text, Bug is given options of activities to do. No long to-do list here. 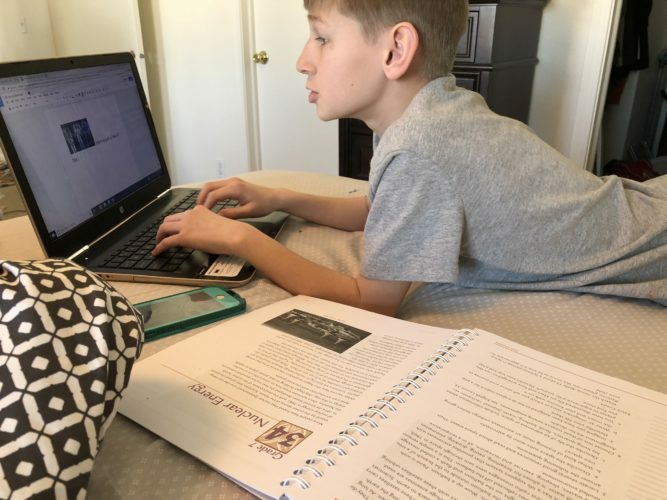 I know I have spoken about the value of choice before, and why I love it so much in middle school curriculum – but I will say it again – Homeschooling pre-teens is easier when they feel like they have control over what they need to do each day. Middle schoolers are learning what independence means. You want a curriculum that is developmentally appropriate and understands the way kids work. Oak Meadow is that program. If I had used a program that gave me a checklist to work through, I can imagine (okay, I know) I would have spent a good portion of the week butting heads with my child over what needed done, when and how. That’s the key. He was able to choose anything related to the space program to learn more about. He could have chosen to look at the Apollo missions, a famous person, how rockets work . . . anything. Because he had a choice, there was no drama or whining. Win one for Mom and Oak Meadow. Next, the curriculum contained a hands-on activity and a discussion on propellants and thrust, which is where things got really fun for Bug. 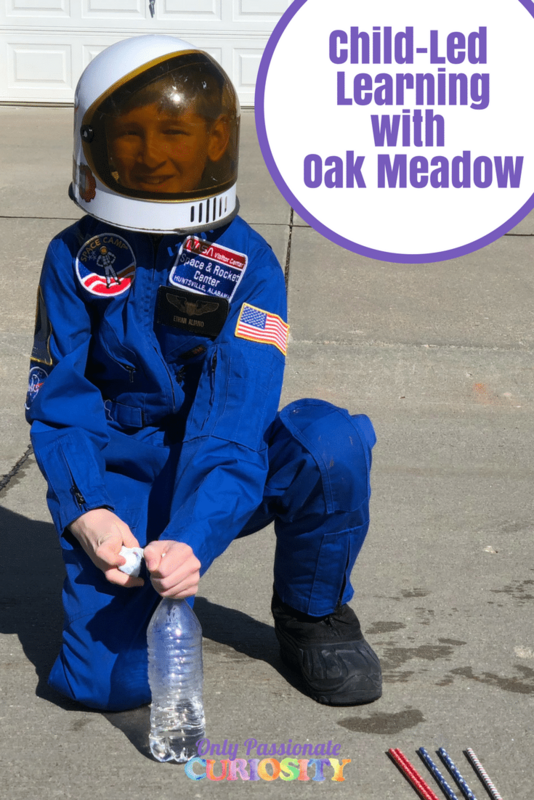 Oak Meadow allows for extra wiggle room in our schedule, so once Bug did the initial experiment, he went down a rabbit trail and learned more about reactions, propellants, and came up with an idea to try another similar experiment. Then, he took the time to put together a video of both activities (because he wanted to make sure I could share them with you!). Because he had the time and freedom to explore, a simple assignment in his history text lead to extra science explorations. He designed an experiment, he did additional research, and he learned how to use video editing software. Another huge win for Mom and Oak Meadow. Bug will be the first person to tell you that he doesn’t really like language arts, and doesn’t like writing. 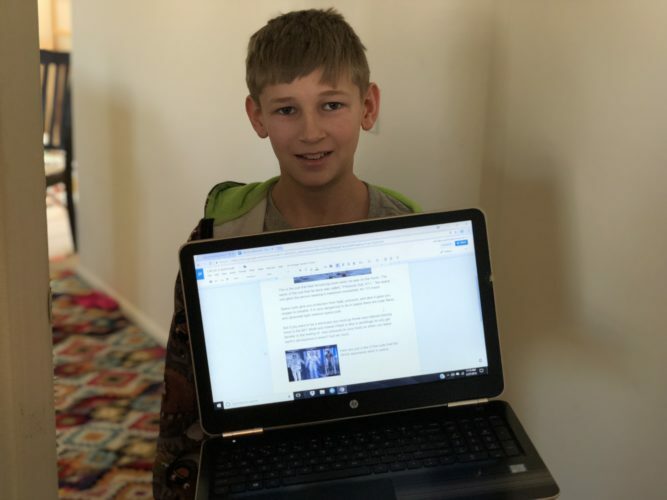 But, when it came to learning about space, he was happy to put together a booklet to show me how space suits work and what they do to protect astronauts. He wouldn’t call himself an artist, but creating a video falls into the category of visual arts easily. He may roll his eyes if I ask him to research something, but he happily spent hours reading about NASA. We had a blast this week. Sometimes, I need the reminder that I don’t have to always stress about what the kids are learning and doing. 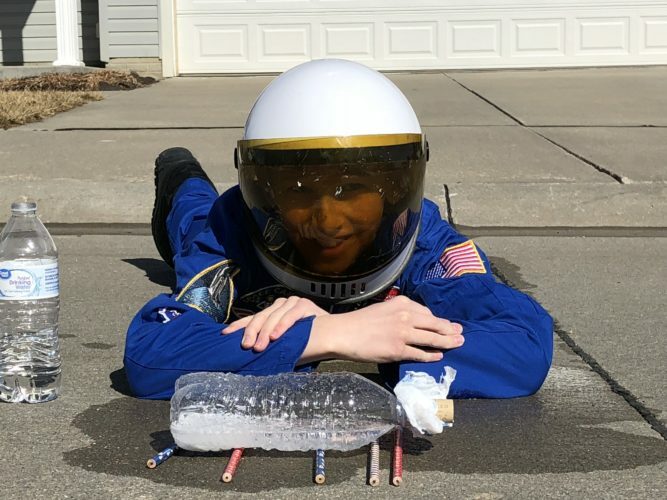 With a little bit of space (and access to resources), my naturally curious kids are going to want to learn more about the things they love, and when they do that, they’ll practice the important skills I want them to learn. Check out Oak Meadow’s programs. You can use it as a full curriculum, or just pick up a subject or two for your kids. We’ve done it both ways, and have always enjoyed our experience. Leave a comment if you have any questions about the curriculum, I’ll be happy to help you out! Have you ever taken a step back to allow your child to explore on their own? How did it work out for you?